Set amongst our beautiful College gardens, we offer a variety of room types for students of different year levels. 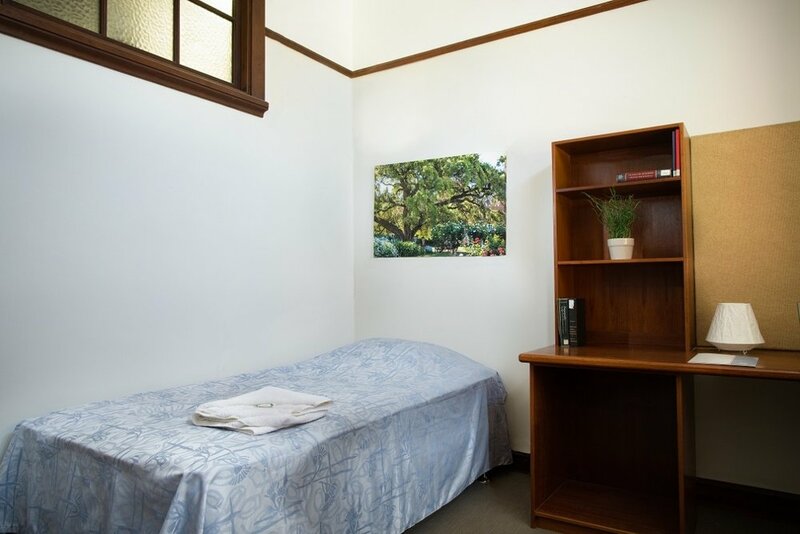 First-year rooms are fully-furnished with single beds, air conditioning, WiFi, and shared bathroom and kitchen facilities, while more senior rooms may include a double bed, en suite and/or kitchenette. The majority of our rooms have been newly renovated for a more modern and comfortable College experience. All rooms are fully-furnished with a bed, study desk, chair, shelving and wardrobe. All rooms have internet access and reverse-cycle air conditioning. Students have access to shared bathroom, kitchen and laundry facilities. Rooms are professionally cleaned once a week. Cleaning and utilities are included in your fees. Have you considered sharing a room? At St George's, we offer shared rooms at a discount fee. Get the same great college experience and services while rooming with a friend. Refer to the Fee Schedule for more information. 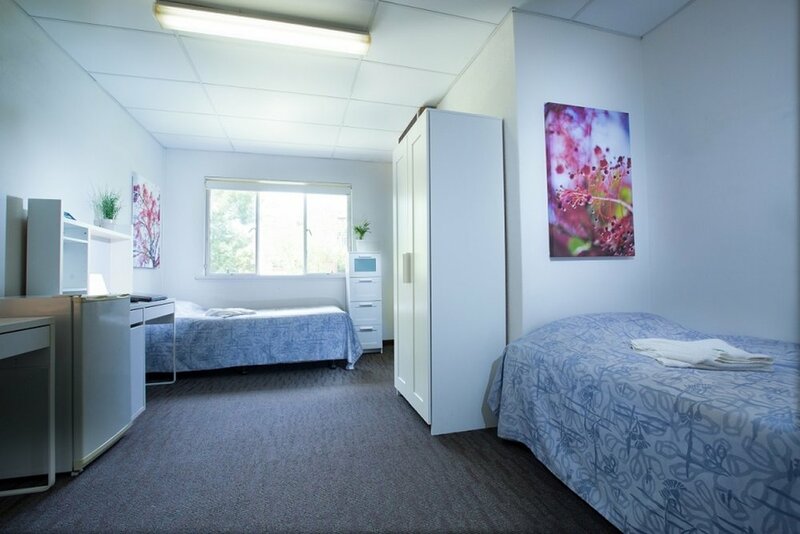 We try to accommodate the needs of older students with more self-contained rooms that may include a double bed, en suite and access to kitchenette facilities. We also offer three-person townhouses. St George's College provides a full meal schedule of 21 meals per week (3 meals a day). All meals are included in College fees, and we cater for vegetarian, gluten-free, and other dietary requirements. Continental breakfasts are available daily with cooked breakfast offered on weekdays. Lunch includes hot meal options and a salad / sandwich bar. Dinner includes a selection of hot dishes, salads and dessert. If you're going to be away for lunch or dinner, packed lunches and late dinners are available. Tea and coffee are available all day for your caffeine fix, as well as fresh fruit. The College also holds regular 'Formal Dinners' and 'Practice of...' dinners at which everyone dresses up for a three course meal, accompanied by a talk given by an interesting guest and musical performances. Our student care centre is your one-stop-shop if you have any issues or questions about university, college or life in general. Chat to our trained staff and student advisors and stay stress-free! The College has a number of spaces available for music practice. There is the soundproof music room with a grand piano, drum kit and keyboard, the dungeon and the chapel. There are also pianos scattered throughout the college so you will never be without a practice space. Our common rooms are social spaces that will fit any occasion. Have a chat or watch a movie in the Junior Common Room; make some snacks or have a board game in the Café or play some pool, table tennis or a video game in the Clubrooms. Whatever you do you’ll be sure to find a space to do it in. 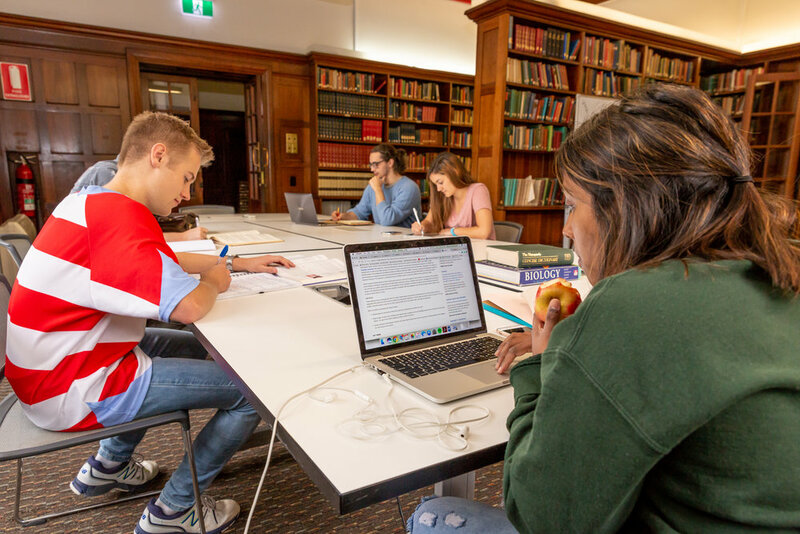 The College features a range of spaces for silent individual study, group study and tutorial teaching, as well as a library containing university textbooks. The Quadrangle is a great space for enjoying the outdoors, whether that's doing some uni work in the sun or watching the ducks playing in the pond. College fees include membership of the UWA Recreation and Fitness Centre, which is just a two-minute walk across the road. It's equipped with more than 120 exercise machines and provides 40+ fitness and recreation classes per week, plus tennis, squash, basketball, volleyball, badminton and netball courts. There's no need to bring your car to college thanks to our Student Car Share program. Residents have 24/7 access to multiple on-site cars which are well-maintained, easy to use, and economical. Click here for details. Don't underestimate the benefits of beautiful surroundings... when you can look out your bedroom window and see the Swan River, our heritage-listed buildings and the College gardens in full bloom, it's hard to imagine living anywhere else!